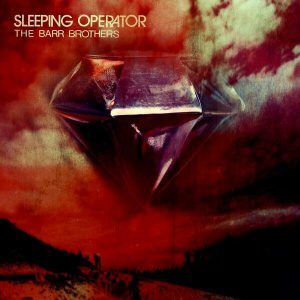 Since first hearing their album ‘Sleeping Operator’ back in October 2014, I was hooked on The Barr Brothers infectious sound. Their carefully crafted songs fuse Blues, Folk, Rock and Country in a unique and refreshing way. Lucky for me that a few weeks after hearing them they were in town, so I took the opportunity to see them play at Bush Hall in west London. They put on a fantastic show, it was definitely up there as one of the best gigs I’d seen in a long while – not least due to the amazing playing and natural musicality that was on display. This tends to happen to great effect with siblings and always creates something more solid to my ears. Brad and Andrew Barr’s instinctive, deeply focussed musicality was of no exception. The pièce-de-résistance was the beautiful contribution of Harpist and multi-instrumentalist Sarah Pagé. The Harp lines wove seamlessly throughout the songs adding an almost ethereal harmonic texture, enhancing the sound as a whole, while her backing vocals complemented the brothers voices to great effect. Skip forward to 2018 and I’m back attending another gig to see the Barr Brothers – except this time, (as fans feared from revelations emerging online) minus Sarah Pagé. 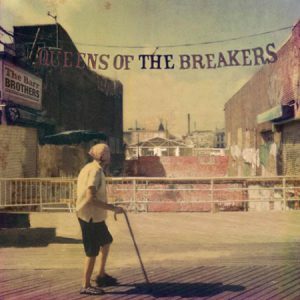 The news of her departure from the band shortly after their biggest album release yet – ‘Queens Of The Breakers’ featuring Pagé, left some feeling disgruntled, fearing it wouldn’t be the same without her. This was a particularly tender point for some, as the gig date itself had already been postponed due to The War On Drugs enlisting them as support for their Alexander Palace show at the last minute. 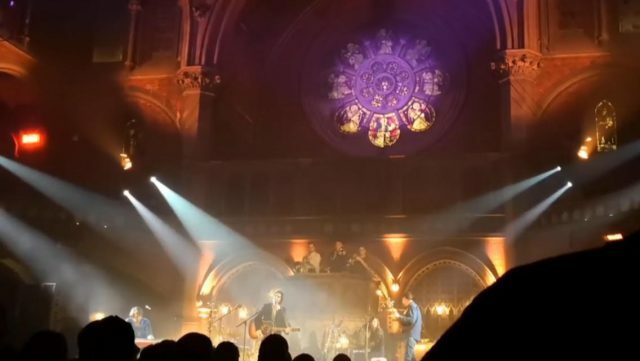 The night of the Union Chapel gig was upon us and as we expected – no Sarah Pagé, however the band were joined by a new member – whos name I didn’t catch (let me know in the comments section if you know!) she did a fantastic job playing Pagés role – albeit with harp parts played on keyboards and other instruments. This newest member has a fantastic voice and did a great job performing Pagés backing vocal lines. After a short acoustic piece, the band launched into ‘Defibrillation’ the first track on the new album. An incredibly beautiful rendition, pretty much as you would hear on the record – the last few drum beats rang out on their own like a mighty engine defined by the stonewalls of this great venue – The Union Chapel. From then on in, the band played…oh they played! and wow – yes it sounded good! It wouldn’t be an exaggeration to say that they played with so much passion and natural musicality that any naysayers would have to eat their own words, saying that it wouldn’t be the same ‘Harp-less’. The songs on the new album feel very organic to my ears – each instrument given its own space to breathe and add its personality to the mix and this really came through on the night. A nice touch to see was the addition of a three-piece horn section helping to create further dimension to the sound. The audience were treated to an improvised ‘riff duel’ between Brads acoustic slide guitar and Morgan Moores double bass riffs, at the start of an extended (and extra bluesy) version of ‘Half Crazy‘, each aiming to outplay the previous line – showcasing just how great both these musicians are. At points in the set, the sound leaned towards more a psychedelic feel –‘It Came To Me’ was delivered with some great playing on the overdriven lap-steel guitar reminiscent of David Gilmour’s tones on Pink Floyds ‘One Of These Days’. ‘Maybe Someday’ featured vocals through a low-fi distorted mic, hung lower on the mic stand, Brad Barr stooping to sing through it. Other contraptions were used elsewhere to create interesting feedback effects and general quirkiness. ‘Come In The Water’ was another highlight for me, such a great track from their ‘Sleeping Operator’ album – started with a ‘slow dance’ feel with shimmering lighting to boot. Brad Barr’s guitar approach is inspirational to behold, using lengths of cotton thread attached to his guitar strings and pulling them to create sound effects, as well as using his acoustic more like an electric guitar – he used it to play the last track ‘Love Ain’t Enough’ featuring some fantastic overdriven guitar solos near the end as well as elsewhere in the show. A quick look at the stage floor after the gig revealed a love for guitar effects pedals, from the likes of Strymon, Electro Harmonix, TC Electronic and many more – each having their place in the Barr Brothers soundscape. As one happy punter put it at the end of the gig to great applause – ‘…What a band! What a f**king band!…” – yep, no one is going to contest that now! The gig is already up there as one of the most memorable for me. The beautifully crafted tracks kept on coming one after the other – made even more special by the venue itself. The chapel helped create a great space and atmosphere for these songs to live in, particularly on tracks such as the hymn-like reprise to ‘Hideous Glorious‘. The Barr Brothers have proved that they will not be defined by one band member and people can safely stop Harping on about it now! If you get a chance to see them live, grab it with both hands – you will not be disappointed. I hope you enjoyed reading this review and if you were there how was it for you? Have you yet to see them live? You have just reminded me that my wife and I need to find more time to get out of the house, away from the kids, and just have some fun together. We tend to forget great times like the one you have shared with us and our whole life is about the children. Thanks for sharing this. Hi Rick, glad you enjoyed reading the review. Going to see live music is such a great way to spend time, particularly with your significant other! Right here in Laval! They are touring around their hometown these days. Great I bet it will be a great show! Did you have any other musician guests you organised for TED? Yes, although not in a venue as beautiful as yours! We have booked another type of artist who will give a performance/talk, but we may have another musician again this year. We had a member of UZEB, a great Montreal jazz trio (I encourage you to look them up! ), but he had to back out, because he will be out of town for family reasons. Hey Louise, i’ll definitely check out UZEB thanks for the heads up, good luck with your next event i’m sure it will be a great success! Thank you Rob! The Barr Brothers show last night was GREAT! cool, thought it might be, they delivered again!